We love our pets. We want to remember them. Do you ever make a password to honor a pet that has passed away? Maybe you use your current pet. Lora's Law #4 is all about forgetting which pet is your current favorite and your current password. If you are guilty, please share this meme on Facebook. Enjoy! 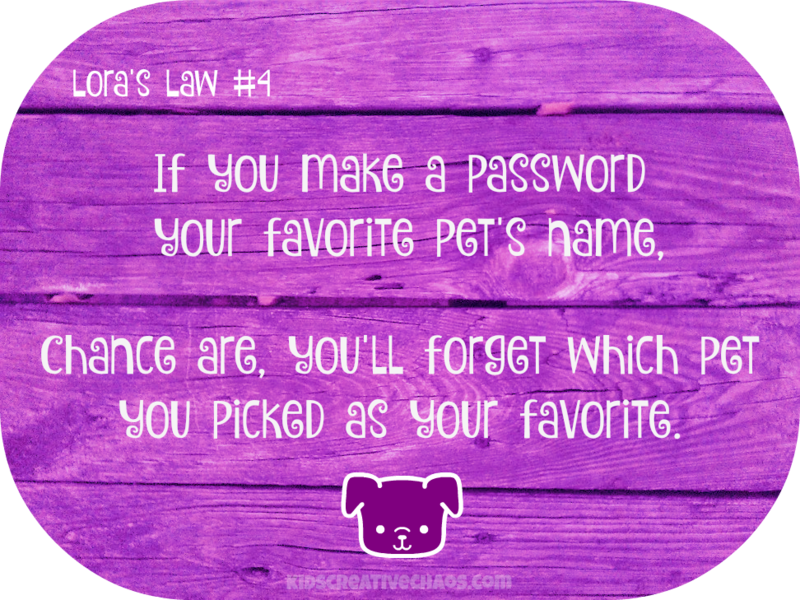 Lora's Law #4: Forgetting favorite pet passwords. "If you make a password your favorite pet's name, chances are, you'll forget which pet you picked as your favorite." All the time. This is a common password security question. I always have to think. I start in order from my first favorite pet to whichever is my current favorite pet or my favorite pet of all time. Sigh. I have had more pets than most! I need a new password technique.